Raising money for a startup is expensive. The typical legal fees for a Series A are about 1% of the total money raised: roughly $40k on $4M. Of course, this doesn’t factor in the time for the process and the dilution of the investment. 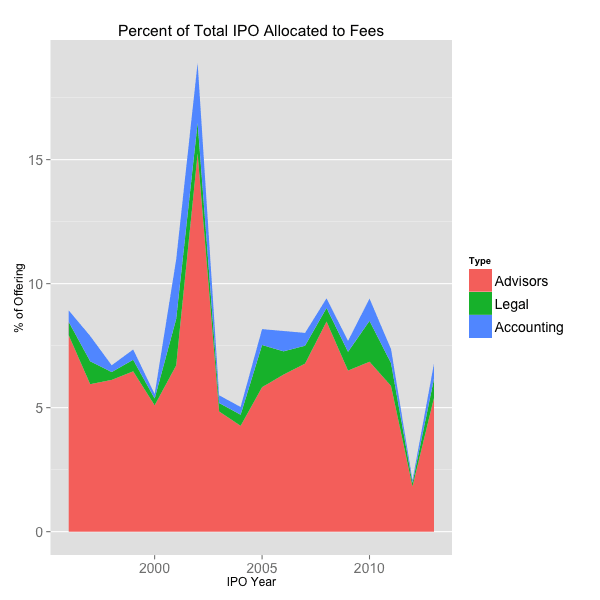 But if your startup is considering an IPO be prepared to pay eight times as much in fees. Across 360 venture backed technology IPOs in the last 10+ years which on average raised $107M, 8.8% of the dollars the startup raises in the initial public offering is paid to investment banks, accountants and attorneys. Below is a chart of the fee breakdown. Along the x-axis are calendar years. The y-axis shows the percent of the dollars raised which are immediately paid in fees. Investment banking/advisor fees are shown in red and receive the lion’s share. Legal fees, primarily for writing the prospectus and ordering the company’s affairs, and accounting fees for auditing and preparing the financials, are marked in green and blue. The average fee hasn’t changed much in the past decade except for 2012. The blip in 2012 is an abberation caused by Facebook’s IPO which raised $17B and paid $182M in fees, representing only 1% of the dollars raised. Facebook’s huge IPO and significantly lower fees raises the question, do larger IPOs pay less in fees? The chart below, which compares IPO size to the proportion of fees paid, answers that question. The x-axis shows the IPO size in Log10, so the number 2 corresponds to $100M raised, and the y-axis shows the fee share. 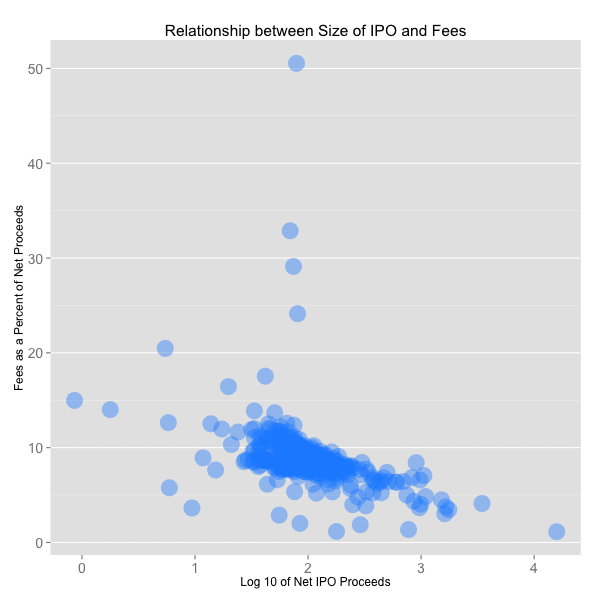 Larger IPOs do command lower fees (the R^2 is about 0.44 indicating a moderate amount of correlation), but so do a handful of smaller IPOs like Google and Zynga, among 18 others with fees less than 5% of the amount raise. Exceptional companies, those that will likely do very well trading in the public market, command lower fees because many providers are vying for the business and willing to reduce their margins to win the trophy customer. Going public has many benefits including access to far larger pools of capital, greater share liquidity and PR. Among the costs involved in the process, service provider fees are some of the most significant and sap nearly 10% of the proceeds.